Yesterday I posted the above picture and asked for guesses as to where the chair was located. A lot of people were able to correctly identify where it is! The chair is located at Gaston’s Tavern in Magic Kingdom. This fun little quick service restaurant is nestled between Be Our Guest Restaurant and Under the Sea – Journey of the Little Mermaid. This is also the same area where guests can meet Gaston. Outside the tavern you will find a fountain inspired by the one in the animated movie. The fountain shows Gaston standing tall with one foot on a rock and one foot on LeFou’s shoulder. Gaston is holding a barrel that is spilling and Lefou is trying to catch the spilling liquid in his cup. The fountain is a fun photo opportunity by itself or as a background to take a picture in front of. Once you step inside the tavern there is no mistaking where it gets its name. The chair, which is actually Gaston’s chair, is located in the dining room with the fireplace. Above the fireplace is a gigantic picture of Gaston on top of a mountain looking very proud of himself. The frame of the picture is outline with different sets of antlers and there are light fixtures made out of antlers, as well. These decorations are pretty similar to what the tavern looked like in the animated feature, just take a look at this picture. One of my favorite decorations at Gaston’s Tavern is the dartboard in the other dining area. It’s hanging on the wall and it shows that Gaston and LeFou have been playing quite a few games. Of course, poor LeFou has only won five games compared to the sixty games won by Gaston. Not only are the decorations fun here, but there are some good snacks you can pick up while visiting. The big cinnamon roll is a favorite among guests, as is the specialty drink “LeFou’s Brew” which is made up of frozen apple juice with a hint of toasted marshmallow and topped with a passion fruit-mango foam. Guests can also get a souvenir cup when ordering LeFou’s Brew for $12.99 (without the souvenir cup the drink costs $5.79). The cups are cute and if you like to collect souvenir cups these would make a nice addition. So if you haven’t been to Gaston’s yet, check it out the next time you are in the Magic Kingdom. 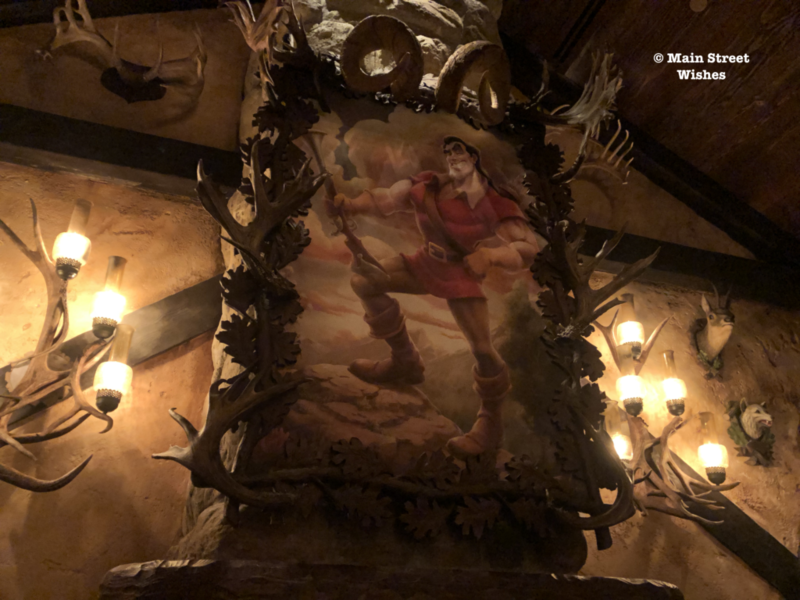 Even if you don’t order anything, it’s worth it to go in and sit in Gaston’s chair and check out the other decorations. Thanks to everyone who played along this week and congratulations to those that knew where the chair is located! We’ll play again next Wednesday! 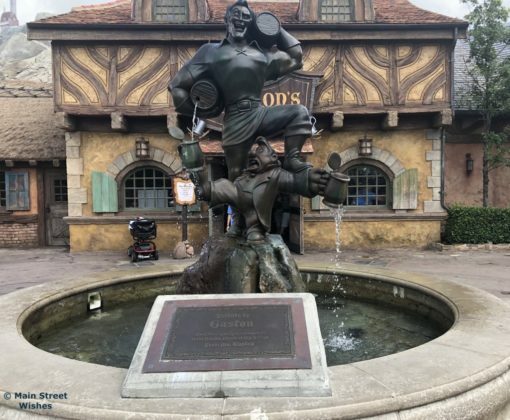 Have you been to Gaston’s Tavern? 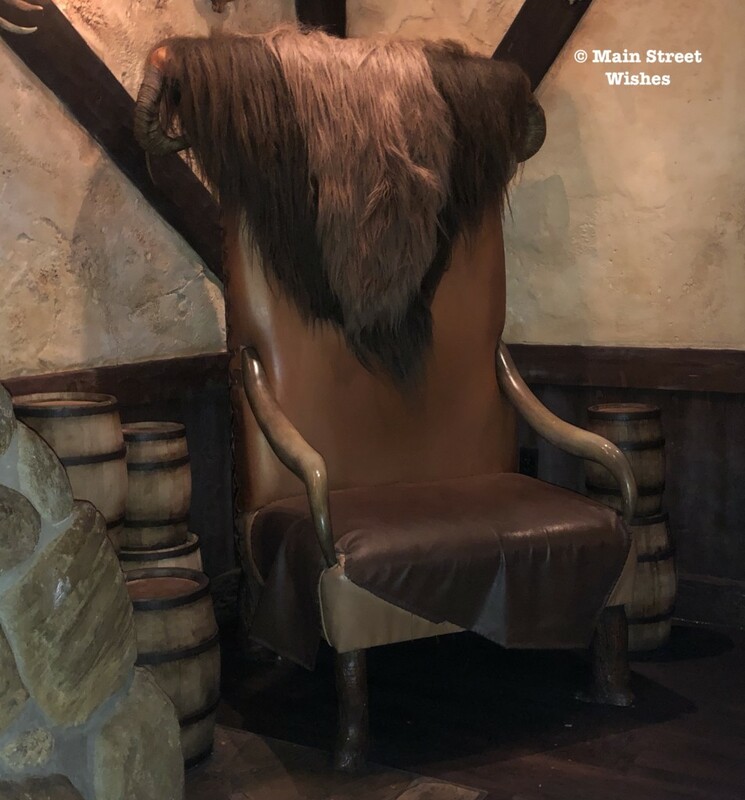 « Where is it Wednesday: Where on Disney World Property is This Chair Located? Lol, we ate there for the very first time when we went with grand babies in 2017. Then to the right of it is bathrooms right? Okay, be it that it was our first time at that place I am excused from not know answer! Always go with your first thought!